Want to get better at climbing? Here's (nearly) everything you need to know. It’s one thing to grind your way up a steep climb, body rocking back and forth, bike barely moving forward–or even staying upright. It is another to gracefully ascend into the high mountains, your movements a lesson in fluidity, efficiency, and grace. Indeed, handling truly steep ascents (10 per cent gradient or more) requires both fitness and skill. Here are some of the keys to progressing beyond survival mode when climbing. 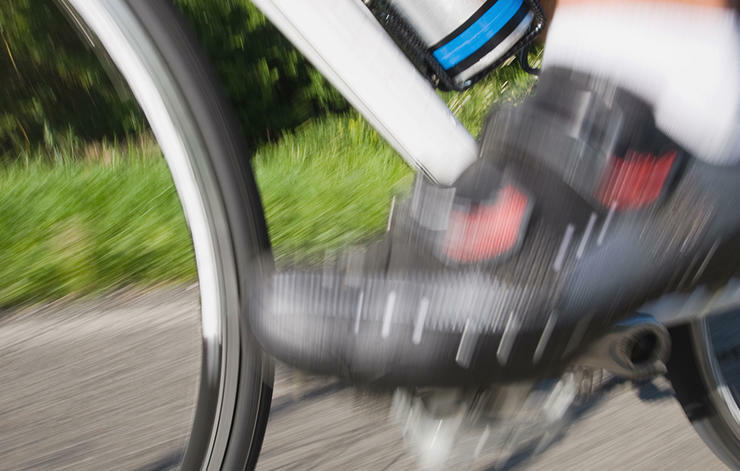 Rather than grinding away in a larger gear, shift into an easier gear in order to keep your cadence high. Aim for at least 80 rpm, 90 if you can muster it. For most cyclists, this higher spin rate will lengthen the time before their legs become flushed with momentum-killing lactic acid. Of course, one’s ability to keep the legs churning will be influenced largely by the available gearing on your bike. It used to be that if you wanted to ditch the heavier triple chainring setup, your only alternative was a 53-39 double chainring, which frankly doesn’t bode well for going up steeps hills. That 39-tooth little ring is too large for most amateur cyclists to spin up really steep hills. But nowadays many, if not most, bikes come stock with 52-36 mid-compact setups, or even 50-34 compact gearing. The smaller little ring allows you to spin that higher cadence. And while you do lose some top-end speed because of the smaller big ring, unless you’re a wannabe sprinter this shouldn’t be too big a deal. When a climb becomes so steep that your cadence drops below 70 rpm, it is time to rise out of the saddle. This allows you to use your upper body to help your legs keep the pedals moving. In order to get comfortable and efficient with this position, use long, gentle hills to practice moving from a seated to standing position. Your seated position should be with hands on the bar tops near the stem. Pull lightly, keeping shoulders and hips square. This keeps your upper body relaxed to reduce energy cost and maximise lung capacity. Before standing, switch your grip to the brake lever hoods. Rise and bring your hips forward, straightening and lengthening your lower back and opening your chest. The saddle’s nose should just brush the back of your legs. Try not to pull with your arms on easy hills because it taxes your muscles with little return in speed. Let your weight help as you smoothly pull your body over one pedal, then over the other. Pull up on the right hood as you push down with your right foot, alternating right arm/right foot, left arm/left foot. The bike will rock subtly beneath you, establishing a rhythmic powering of the pedals. 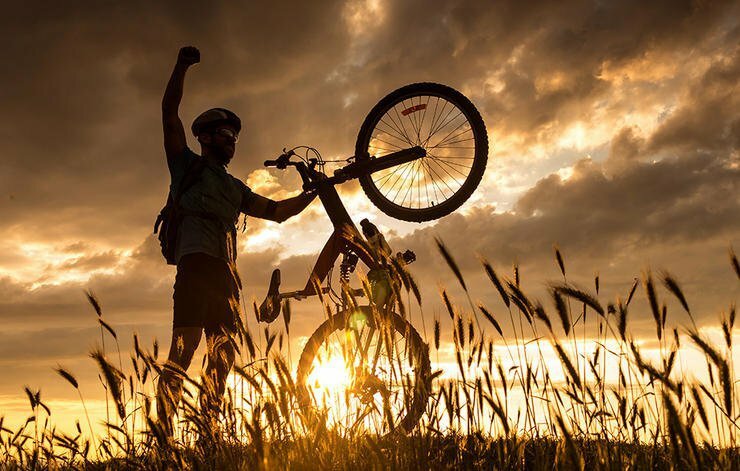 Get out of the saddle as much as necessary to climb hills comfortably, but don’t stay standing forever. For most riders, standing is more fatiguing because it uses extra upper-body muscle. Many riders alternate periods of sitting and standing just to mix up the stress on various muscle groups. Your upper body, that is. 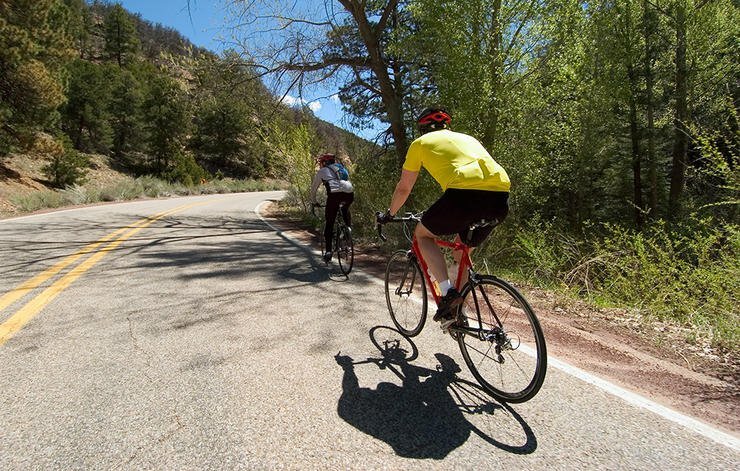 On steep grades, come up off the saddle and hold your bike as vertical as possible, with minimal sway. It’s critical to keep your shoulders squared and facing forward. Don’t drop them or create a snaking motion that wastes energy. 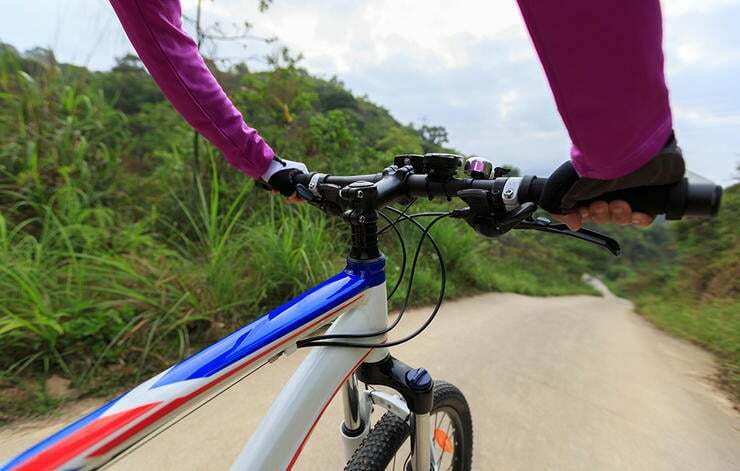 In order to maintain momentum when climbing on a steep grade, you need to be rock-solid off the saddle. 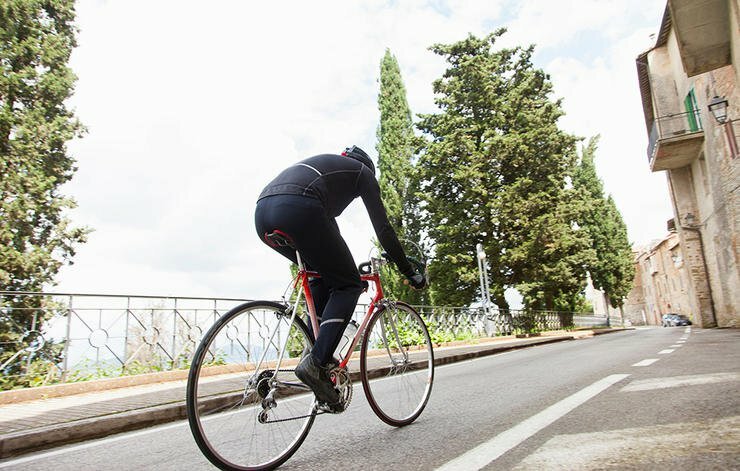 Many riders don’t control their body and bike motion, making climbing a struggle. Work on being quiet and efficient. If the grade threatens to rob your momentum completely and you are nearly at a standstill, try pulling back with both hands in unison on each downstroke. This lets you put maximum force into the pedals to keep the bike moving. Continue until the grade lessens and you can return to a normal climbing technique. Give your body a shot of fuel right before you start your big effort. 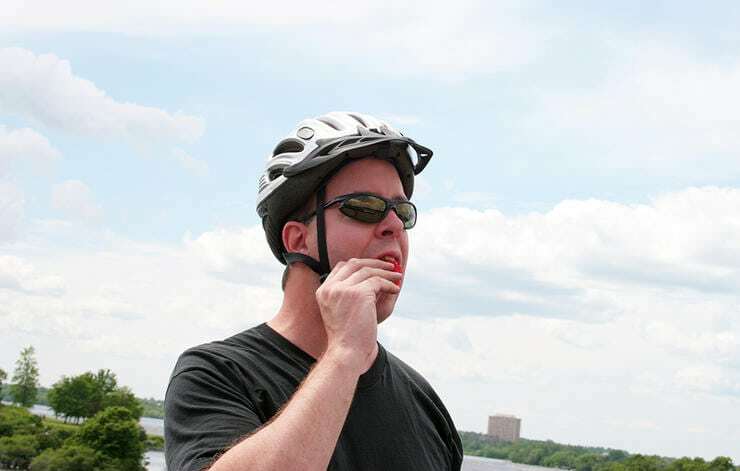 It’s a lot easier to slurp down a gel or take a bite of a bar when you are not completely cross-eyed. Rather than speeding up, slowing down, and speeding up again, try to find a pace that you can sustain for the entire climb. 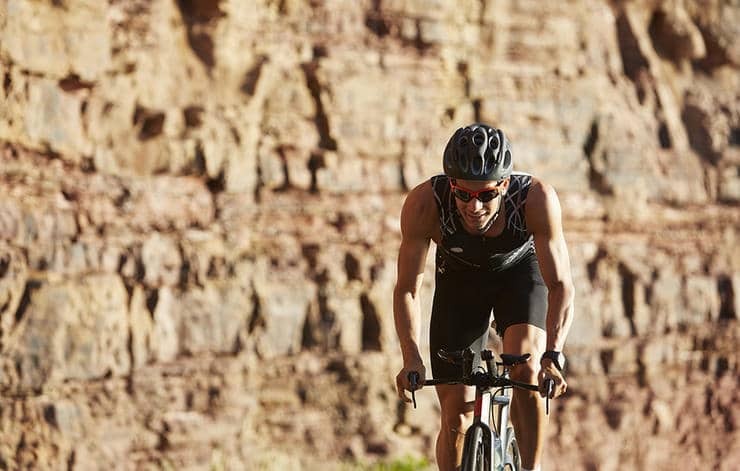 “It’s easier to climb utilising a constant rhythm than it is to surge and slow, which is more taxing on your body,” says Scott Moninger, former pro racer turned coach. If you know that an upcoming event has a 8km climb that averages eight per cent gradient, do your best to replicate that effort in training. Like anything else, practice begets improvement—and doing your best to replicate the climb in training will get your mind and body prepared for how the effort might feel during the event. On the day of your race or big ride, tape some inspiring messages or photos to your top tube. “This will give you something to focus on besides the pain in your legs and lungs,” says Jeremy Powers, multitime US national cyclocross champion. And Last but Not Least: Relax! It’s hard to relax when your heart rate intensifies, your legs are throbbing, and your lungs are burning. But do your best. Keeping your muscles constantly flexed will quickly wear you down. Efficient climbing is a measured effort, where you only want to use the strength and energy necessary to keep your momentum. Gradually, you’ll learn to maintain a controlled style while staying relaxed and breathing evenly. And don’t fret if you can’t always keep your proverbial cool. Hauling your bike up truly steep grades is tough no matter what you do.